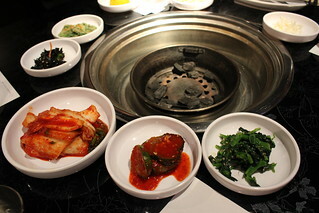 Eight Korean BBQ focuses on pork belly, and has locations in Buena Park, Koreatown, and Singapore. The main attraction here is the eight flavors of pork belly. If the concept sounds familiar to you, that would be because the Koreatown location was Palsaik which also served eight flavors of pork belly. 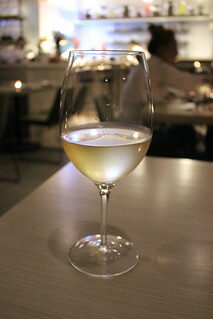 Palsaik is now rebranded (and with much much better service!) and with new menu items. We got the Combo A, which comes with the eight flavors of pork belly plus a seafood stew and mozarella kimchi fried rice for $56.99. It was plenty of food for 2 people and probably would feed 3-4 depending on how much you eat. 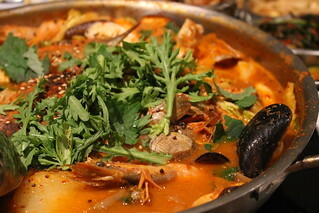 The eight flavors were: hot, miso, curry, herb (mostly rosemary), garlic, black sesame, original, and wine. The black sesame one is a new addition (it replaced the ginseng) and I'm pleasantly surprised how well the sesame flavor worked with pork belly. I think the sesame was my favorite this time around, but the garlic and hot flavors are also great. We also ordered the Flower Pork Belly ($22), because it looked so cool! 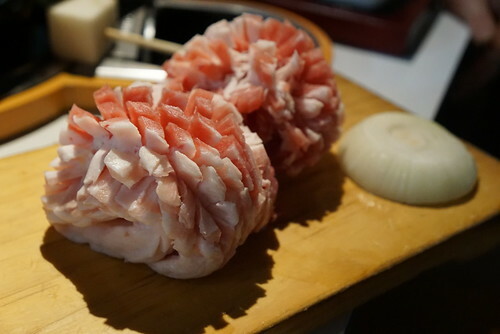 Although we thought it looked more like a hedgehog than flower, but either way it made for a great photo and more fatty pork belly for us to eat. First of all, the new Commissary is beautiful. 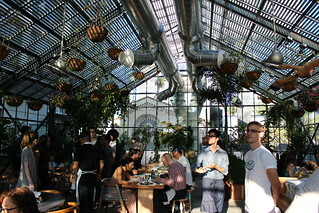 Situated in a green house complete with hanging pots of greenery next to the pool at The Line Hotel in Koreatown, diners can enjoy the LA sunshine all year long. You already kind of feel like you're on vacation when you step in. The menu at Commissary can be a tad confusing at first. You get two pieces of paper. One is the picture menu that shows you the price and main ingredients. The little numbers lead you to the second piece, the "cheat sheet" which tells you how it's prepared ("grilled") and what sauces go on that dish ("lemon, green sauce" - for example). Now, the setting is a green house, and there are a lot of vegetable and produce-focused items, but it's not a vegetarian restaurant. 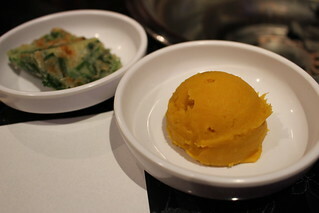 There are a number of vegetable-focused and vegetarian dishes, though. 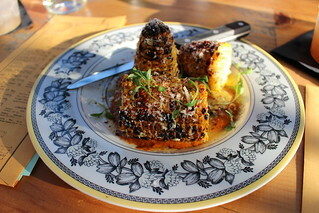 This is Roy Choi after all, so don't expect bland vegetable dishes. Just like the things he's known for, these are full of spices and flavors. The original cocktails were created with the help of Matthew Biancaniello, although he won't be behind the bar. 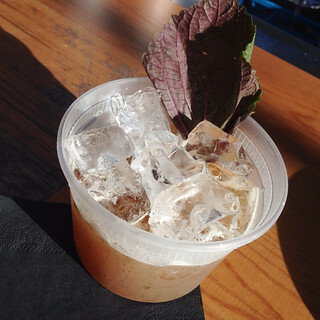 Served in deli cups, you'll find cocktails made with seasonal produce and unusual ingredients like pisco, white peach and anise hyssop; or mojito with zebra tomatoes. 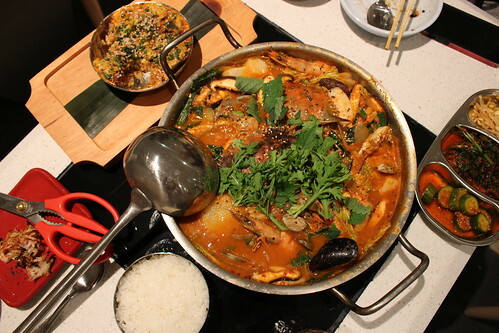 Dishcrawl Hits K-Town, with a Giveaway! 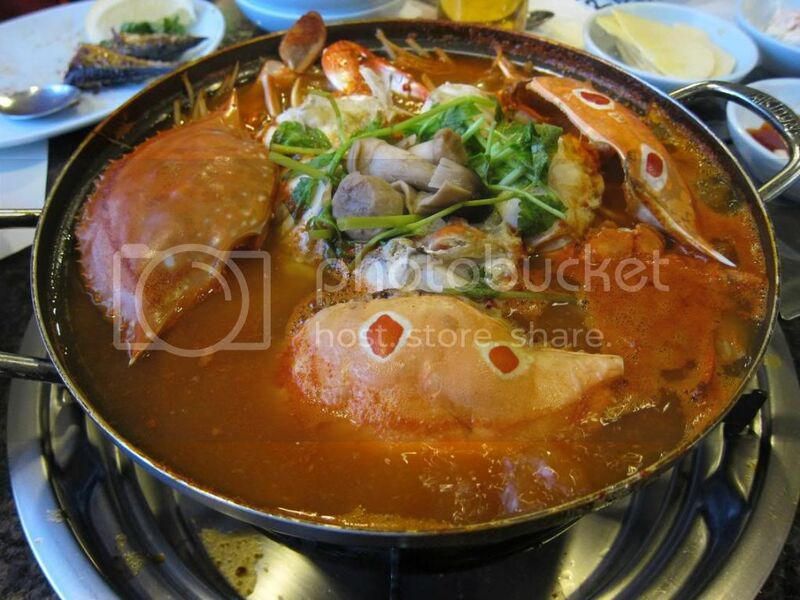 Dishcrawl is the newest walking food tour in town (they're actually nationwide), and next Wednesday on May 21 they are hitting Koreatown. 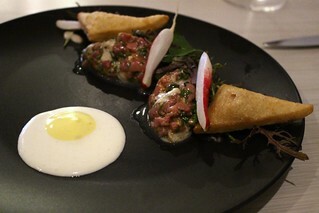 The tour will visit 3 different restaurants, but the itinerary is kept a secret. The only one I can tell you is that they will be visiting Escala, the new Colombian gastropub from Chef Chris Oh of Seoul Sausage! It's not your typical Koreatown restaurant, for sure, and it already garnered many good reviews with dishes like pork skin guacamole and pork belly tamale. To promote the Koreatown tour, they've offered to give away one ticket to the crawl! The tour takes place next Wednesday, May 21 at 7pm. The meeting location will be disclosed 2 days before the event. Note that the giveaway is only for 1 ticket (valued at $45), though, not a pair, but I'm sure you'll meet some cool people there. For more information about the Ktown crawl, check here. I get inexplicable cravings for the goat stew (yumso tang) at Mirak. I say inexplicable but really, the explanation is easy: it's damn good. 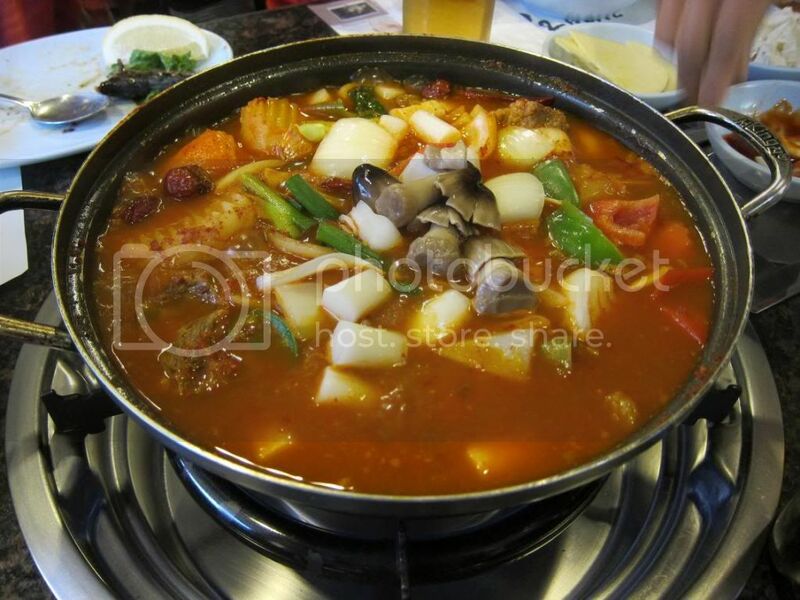 Be it winter or summer, I would still crave this stew. 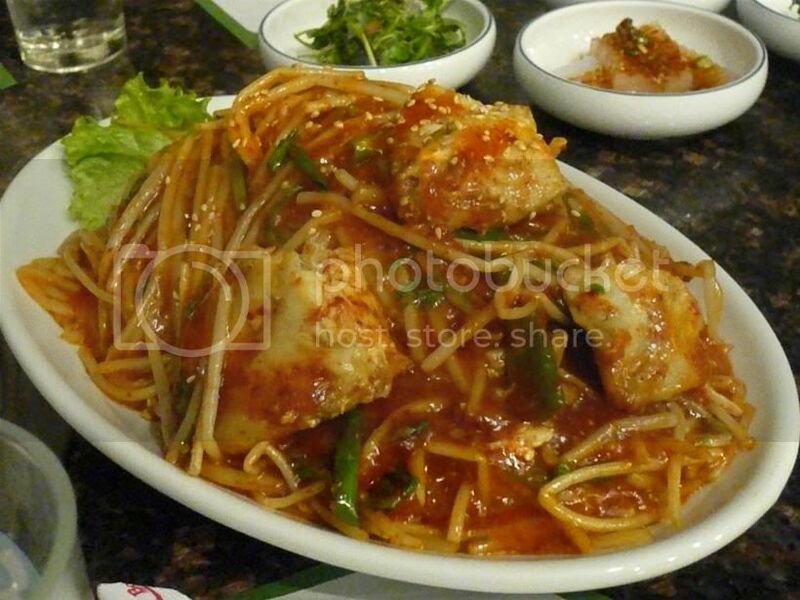 Mirak is (of course) in a small strip mall in Koreatown, hard to find if you don't know what to look for. The yellow sign above the restaurant is all in Korean, but it does say Mirak on the window. Look instead for a sign for "Samil Plaza". There is a parking lot but it tends to be overrun, even when the restaurant doesn't look that busy. 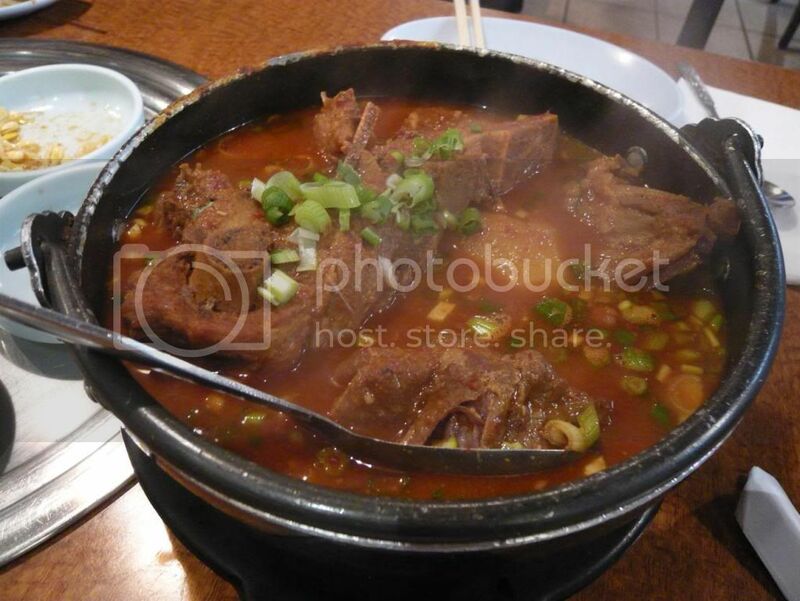 The black goat stew is listed as "Goat meat spicy broth with vegetables served in hot pot". They charge per person, $15 each. 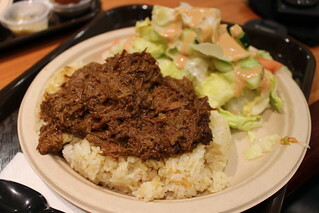 The meat is gamey but the perilla leaves and spicy broth compensate for the smell, and the meat is also extremely tender! The broth is filled with chilies and mustard seed, incredibly flavorful but not overly spicy (if I could handle it, so can you). 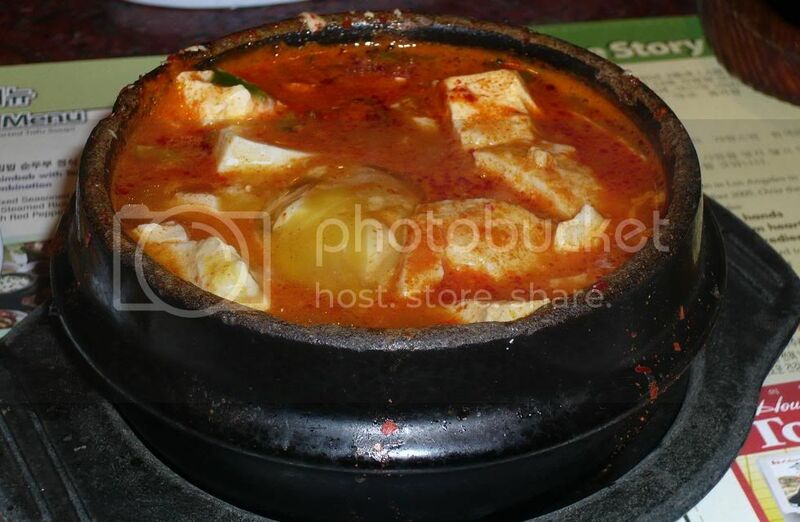 After you finish off the stew (if you don't, the ladies working there will heap what's left onto your plates), they will come by and start the finishing touch: kimchi bokkumbap (fried rice) in the pot using leftover broth. Here they make the fried rice with bits of dried seaweed which added a really nice touch. Usually at the end of a meal for two I will have a container of leftover rice and goat meat, plenty for a meal the next day! Maybe not for office lunch, though. To say the aroma is strong is an understatement. 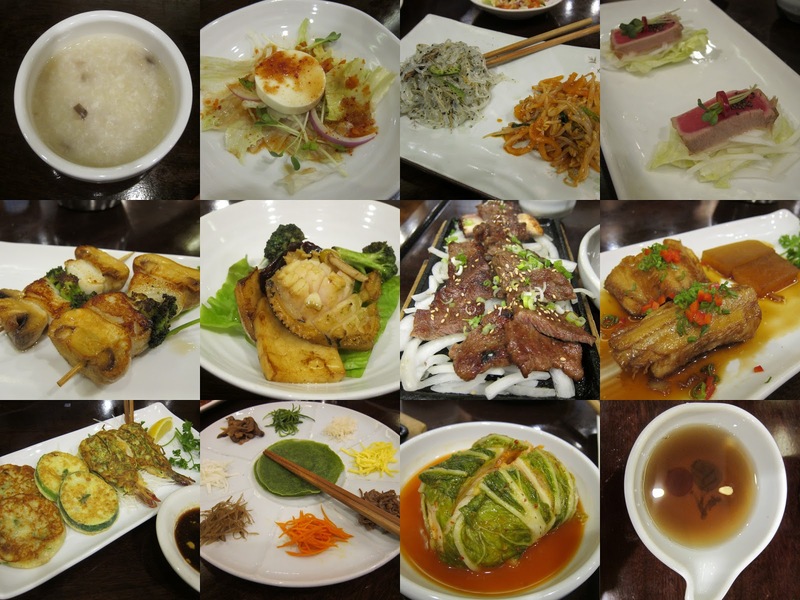 Mirak is one of my favorite places in Koreatown, offering a dish not easily available anywhere else. It hits the spot every time. It's also a good deal for $15 a person, as it usually feeds me for 2 days! 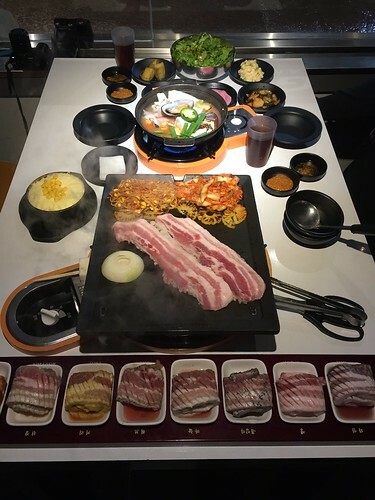 I was recently involved with a project to review a few Korean restaurants in Los Angeles, and one of my assignment was Palsaik Samgyupsal Korean BBQ. I was pretty excited since I had never been to this restaurant which boasts eight flavors of pork belly. The set menu with the 8 pork belly and stew ("Palsaik Set Menu") was $49.95. I asked around as to how many people the set would feed and got answers ranging from "two, but when you get to the rice you won't be able to taste anything" to four, so I settled at three, which seems to have been the perfect number. 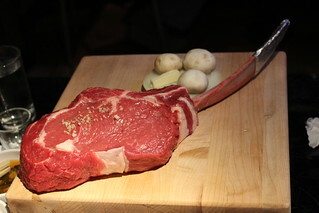 The presentation was also quite impressive. 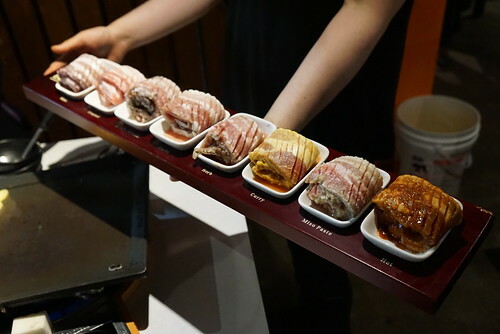 A long wooden board held eight plates of the pork and underneath each one the flavor was printed: Wine, Original, Ginseng, Garlic, Herb, Curry, Miso Paste, and Red Pepper Paste. On the wall they also display the "health benefits" of each flavor, which I thought was pretty funny ... I mean, we're eating eight slices of fatty pork belly here! I don't think the "benefits" of the red wine marinade would really cancel out the effects on your blood vessels. Working Into the Night at Tom N Toms (Koreatown). Open til 4 AM! It's past midnight. You need to get work done, but being in your room puts you to sleep. You need coffee and some snacks, and a change of atmosphere. Is there anyplace you can go? Actually, there is. Coffee houses in Koreatown apparently tends to open late, including Tom N Toms Coffee, which stays open until 4 am (they open at like 6 or 7 am also - who knows when they sleep!). 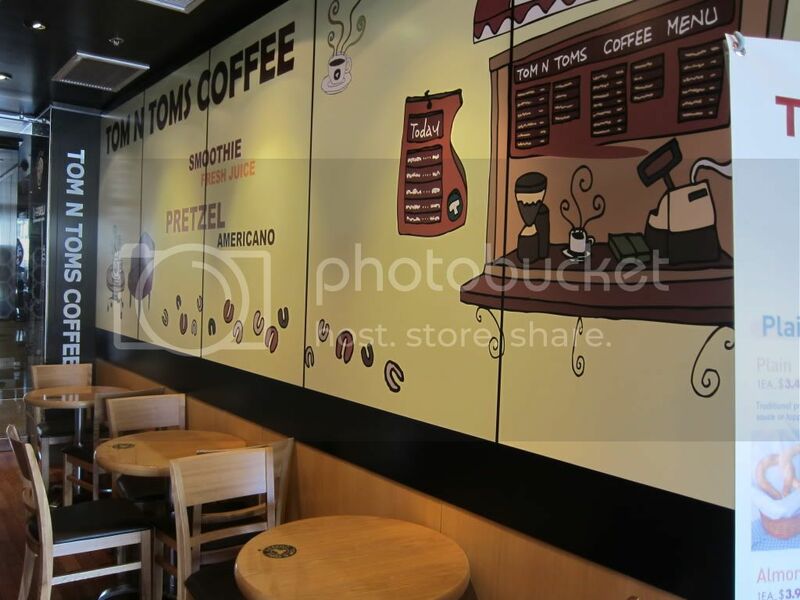 Apparently Tom N Toms is a big chain in Korea. There's only one location in LA right now but they are planning seven more. 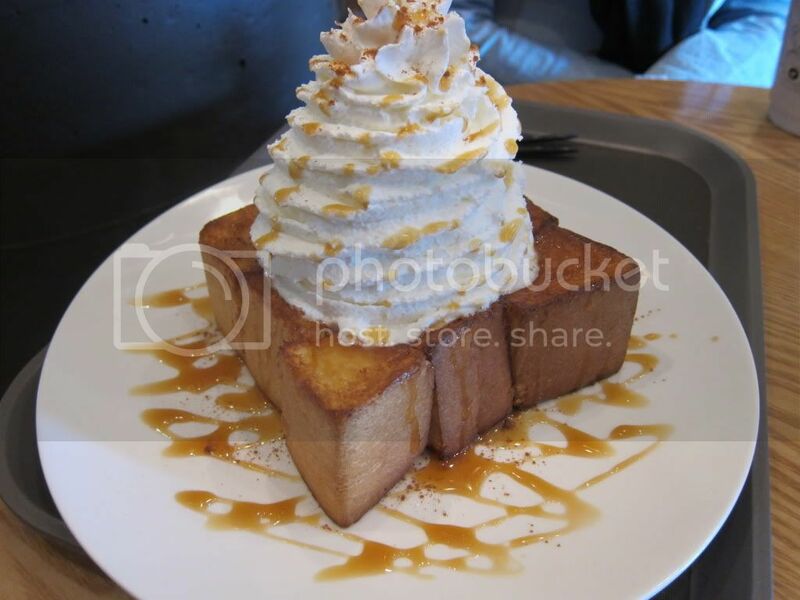 Oh, and they're famous for their butter toast (their version of brick toast). They have different flavors including walnut and caramel, and they also have savory items like pepperoni pretzels. Did I mention there's free wifi? I was told that the most unique drink is their walnut Walnut Tomnccino ($3.95/4.50/4.80). 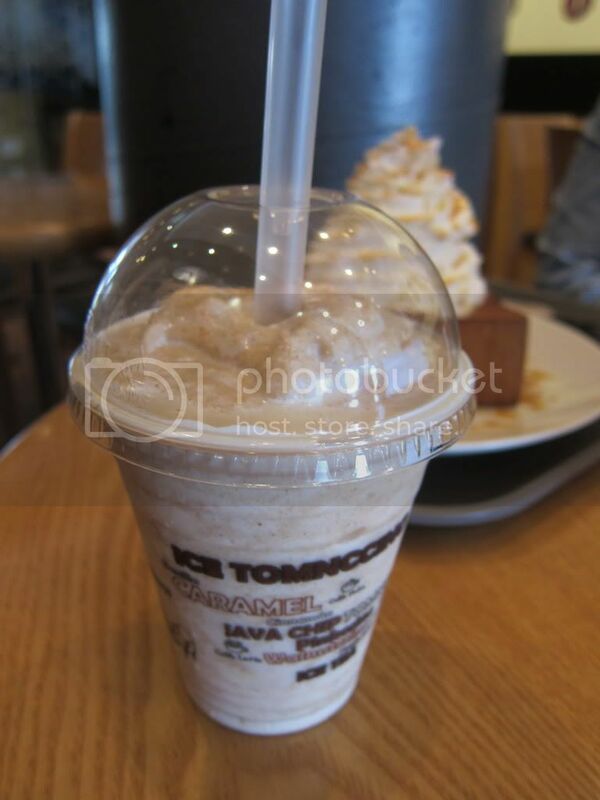 It is actually the most expensive of their frozen blended drinks, but it is definitely different. I had expected flavors from a walnut syrup, but instead it had a strong walnut flavor, as if I was eating a Chinese walnut soup! I tried the Caramel Bread ($5.50). Apparently they have a special toaster for these brick toasts. 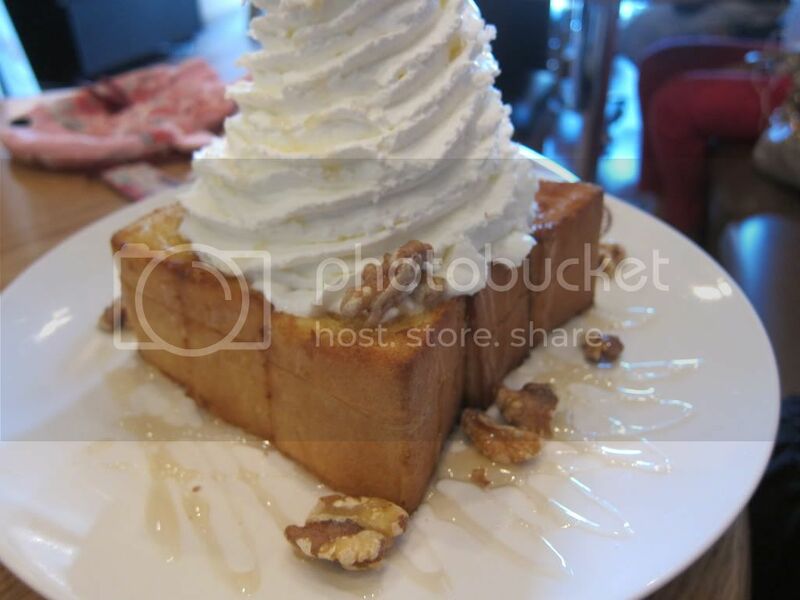 I actually like these better than the famous brick toast at Half and Half Teahouse in SGV. 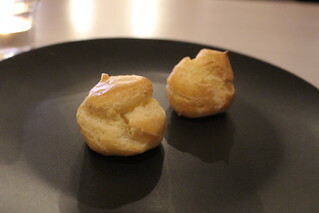 The one here is thicker yet more moist. I could do without the tall whipped cream, but it didn't really hurt either. It's after midnight. You need your laptop and wi-fi handy, plus some caffeine and sugar. K-town is the answer. Disclosure: this visit was hosted.